Working on something for a project... does anyone know when this was published or what it is? PS : and know you intrigued us all. What is that edition ?? 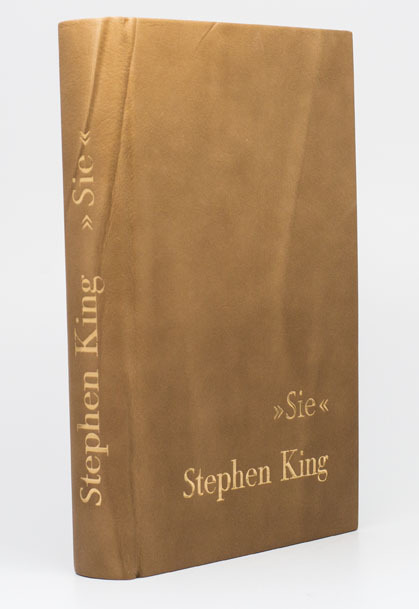 This leather SIE/MISERY book is from the bookshop TRANSGALAXIS. Wow. Learn something new every day! I had never heard of nor seen these before! I forgot to ask... do you know if they did the rebinding work in the year of publication or later on? Thanks again! If I remember my conversations with the Transgalaxis owner correctly, and when I bought my TG books. Do you guys have a stock number for the most common Brodart covers that you purchase? Thanks! I use the archival covers. You can select your height and length. They come 8" to 12" with varying lengths. I get the 10" height and 23" length. They'll fit 9.5" tall King books and most others. I cut the length to fit smaller books. Thanks, guys! Appreciate the responses! Were there 1st/1st of the reissue of the HC of Pet Sematary that was released back in December I believe? That cover looks really cool. I mean, I know it says first ed, but is it really a 1983 book with a new cover? First Scribner edition Hardback edition 2018 with a full number line. So it's not not the original re-done right? By original I mean "oh look, there are a pile of first ed, let's put them out for the movie". No, this is a First (Thus). It's a first printing of a new edition. So I guess if I were in the firmly completest camp, I would have to get it because it's a first printing of a new ed. But what makes it new? Just the cover. I don't know if I can go that crazy about collecting. The line has to be drawn somewhere . Nope, there is no line, sorry, but you'll have to live with it, no line, uh-uh, noooooooooooooo liiiiiiiiiiiiiiiiiiiiiiiiiiine. These are great for tight books in slipcases. A little annoying at times to put on, but really nice to use and easy to cut. Thanks, Ralph. I completely missed this being out in December I guess. I'm on the hunt for a 1st/1st if anyone knows of one. Thanks! I also had no idea about this one! Jesus, these things keep materializing out of nowhere!Thanks for posting Brian. As it's one of my personal King faves I wouldn't mind finding one either . If anyone has a lead on them please share.